I have to admit I never got into the breakfast smoothie bowl thing but cheese grits breakfast bowls are definitely something I would get out of bed for. They are hearty and have just enough decadence to be be satisfying thanks to the generous amount of cheese in the grits and some green onions sautéed in just a touch of bacon fat (go with it, you’ll thank me later). They don’t even require a lot of effort. The grits are made in the microwave and cook in 15 minutes which is about the same amount of time it takes to fry up the bacon and eggs. That means this breakfast is actually doable during the week and doesn’t have to be reserved for special occassions. And you must not skip the fried egg because everything’s better with an egg on top. Am I right? Need to add some protein to your avocado toast? Put an egg on top. Want to make your sandwich more decadent? Put an egg on top. Looking to take some grits and make them into a complete breakfast? Put an egg on top. Runny yolks mixed with some creamy cheese grits is probably one of the most dreamy combinations out there. But why stop at runny yolks when you can add my second favorite topper – bacon! 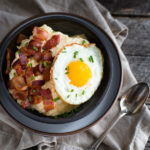 Cooking grits in the microwave may seen unorthodox and may not align with the romantic notion of a pan of grits being slowly cooked and gently stirred until it reaches creamy nirvana but it will keep your morning routine sane and still get everyone happily fed. I recently cooked a batch of grits on the stove-top the old fashioned way and came to conclusion that I really do prefer the microwave method. I think weekend brunch is calling you. You’re welcome. Stir together the grits, water, and 2 cups milk in a large, microwave-safe bowl. Cover bowl with wax paper and cook in microwave on High until thickened, about 15 minutes, whisking every 5 minutes to combine. Stir in butter and cheese. If grits are too thick, heat remaining 1 cup milk and stir into grits 1/4 cup at a time until the grits are the desired consistency. Season to taste with salt. While the grits are cooking, fry chopped bacon over medium high heat in a heavy skillet until bacon is lightly browned and crispy. Transfer bacon to paper towels to drain. Set aside. Pour off all but 1 teaspoon of the fat from the pan. Add onions and cook over medium heat until onions begin to soften, stirring occasionally, 2-3 minutes. When grits are done cooking, stir onions into grits. To serve, divide grits among four bowls. Fry the eggs to your liking. Top the grits with bacon, eggs, and chopped chives. Different microwaves cook on HIGH at different temperatures. I have a 1000 watt microwave and the grits cooked perfectly in 15 minutes. You may need to adjust the cooking time depending on the wattage of your microwave.